2018’s finest metal line up roared through Glasgow with a sense of celebration. 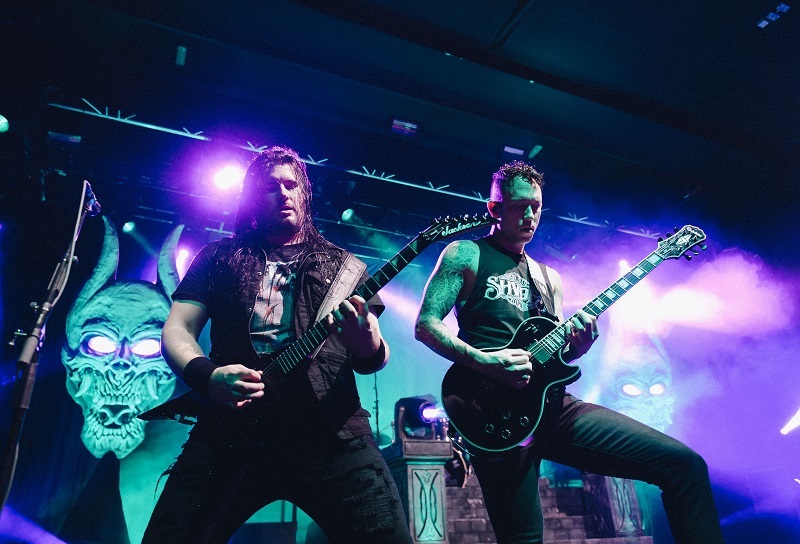 Trivium have played the O2 Academy a few times before, dipping to smaller venues in between, but this time they may be here to stay. Before their victory lap, Venom Prison kick the night off with the heaviest rumbles of the evening. Vocalist Larissa Stupar walks the walk, spending her teenage years protesting neo-nazis, living life as a vegan straight-edge anarchist, and embodying righteous anger. It elevates Venom Prison’s death metal with a sense of transcendent authenticity. The soundtrack to modern political outrage is hip hop because too much of the rock scene has been dominated by inward looking whining – Venom Prison believe in something, fight for something, and their sound is confrontational and uncompromising. This might well be the sound of the future. Power Trip are something else entirely. Last year’s Nightmare Logic already sounds like a bona fide classic, and Power Trip themselves have something of the eternal about them. As comfortable on stage now as they would have been in a skatepark in the 80s, they embody the spirit of thrash, taking the torch from the past and making it essential again. They’re the poster child for refinement over innovation – this is nothing new, but it’s been years since it’s been this good. With enough exposure, they could be one of the few modern metal bands (along with Ghost in particular) to unify different generations of fans. If support bands are there to set the pace for the headliner, Trivium better be doing their stretches backstage. Code Orange have a jetpack strapped to them. Grammy-nominated and album-of-the-year winners in the metal scene the world over for 2017’s Forever, it’s remarkable that something this erratic and weird has had crossover appeal. Played in order, Forever is a jarring and confusing piece of work, and live, rearranged, it’s a mish mash of crushing riffs segueing into industrial glitching. Where Power Trip bring the stomp-stomp-stomp headbanging thrives on, Code Orange’s stop-start approach is even more exhausting than The Dillinger Escape Plan’s mathematical rhythms. When they defiantly shout “they hate us, they imitate us” it all gets a bit performative. Everyone loves Code Orange, and their dabbling with experimental and artistic metal makes them admirable trendsetters, so it’s okay that they’re not badass rebels who have as many enemies as they do fans. Their art speaks for itself, and they don’t need a false image that takes you out of what it is they are doing musically. Forever might change the scene on the merits of how it sounds alone; the band don’t need to adopt villainous and fake personas. Trivium are finally back at the O2 Academy. The first time was after 2006’s The Crusade, the follow-up to their definitive Ascendancy, yet the former’s initially poor reception cooled them quickly in metal circles. They have returned to the venue sporadically across the years but never by themselves – sometimes they were atop a touring festival (Unholy Alliance, Defenders of the Faith) or they were co-headlining (with Killswitch Engage). This time, it’s just them and new record The Sin and The Sentence to prove once and for all they deserve to be considered among metal’s greats. The new album would suggest so. After floundering for the last few years with the accessible but limp Vengeance Falls and forgettable Silence in the Snow, they have returned with something that takes everything good about their past releases and created a synergy of ideas, riffs, and choruses. Matt Heafy is a confident frontman, fuelled by the confidence of how the band sounds in 2018. These are songs to be proud of, and for the first time in a while Trivium sound worthy of being thought of as the frontrunners of a scene. Half of The Sin and The Sentence is given a place in tonight’s set, the band fully aware they’re on to something. Most of those songs, such as the title track, ‘Betrayer’, and ‘The Heart From Your Hate’ all feature the kind of hooky choruses metal can shy away from, yet Trivium excel at. They want to conquer the world, and even if a song like ‘Sever the Hand’ indulges their more brutal tendencies, there’s always an accessible and catchy counterpoint that hints at a broad appeal. It’s easy to forget how long Trivium have been around for. ‘Like Light to the Flies’ and ‘Drowned and Torn Asunder’ are back in the setlist just for the UK part of the tour as a thank you for being embraced so quickly back in 2005. Thirteen years on, these songs are no longer welcomed like old friends as plenty of punters tonight would have been starting primary school when they were released. Just as they have pulled off a storming return to form, they’re about to have a new problem straddling fans of their early material and newcomers. But for tonight, Trivium are finally where they deserve to be: headlining on their own merit surrounded by fans who want them to succeed. This time, they have the songs to back it up. Let’s hope they can stay there this time.